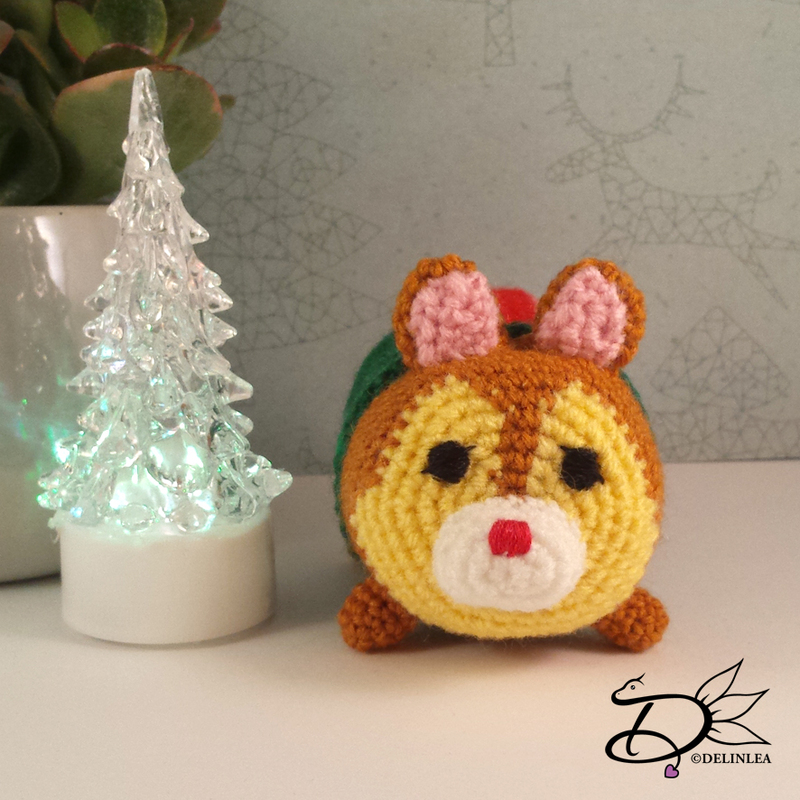 There are only a few days left to Christmas and I decided to make a small, cute tutorial for today. Let’s not stress too much, right?! It’s gonna be a short and easy one today, but I hope you will like it anyway. 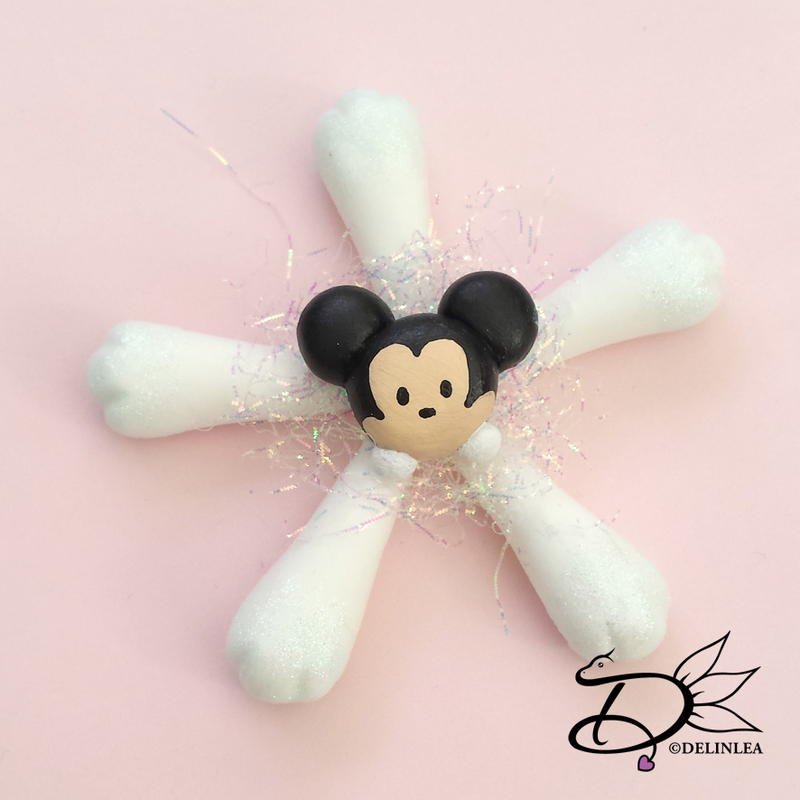 Let’s make some Mickey Bells Ornaments. ♥ Bells in 2 sizes. ♥ A Hot Glue Gun. Now take 1 big bell and 2 smaller ones. 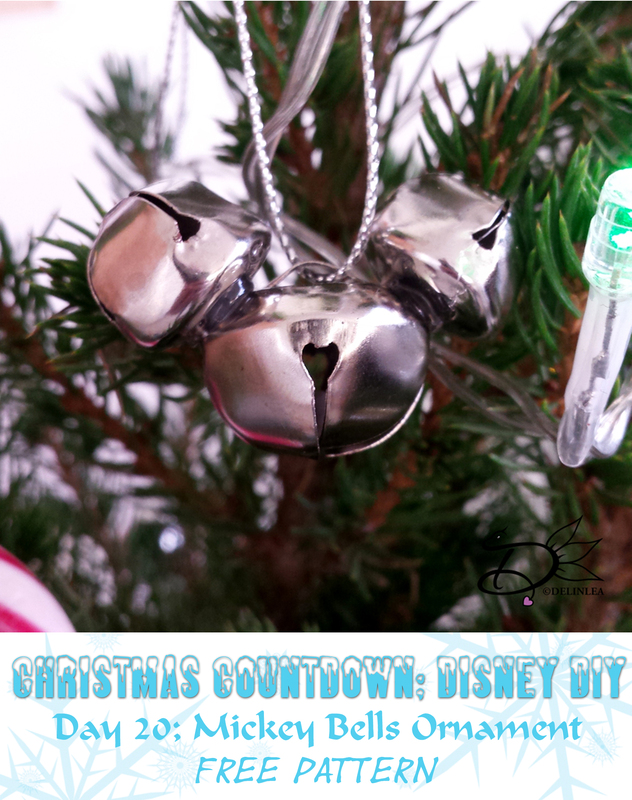 Make sure your glue gun is very hot and glue the smaller bells slightly off the middle of the big bell. This way you create ears on the big bell. And Tadah! you have your mickey bell ornament! haha. Isn’t it cute?! Very easy, but I love how they look in my tree! Show me yours in your tree with the #DelinleaDIY! Don’t stress to much right before Christmas, enjoy those days of prepping. You will regret it if you don’t! Today’s DIY is late and that has 2 reasons. I first was working so hard to get a drawing done for a contest held by Faber Castell. I send it in just minutes before the deadline. Right after I sended my drawing, someone asked if I heard the news.. I was confused, because I didn’t checked any news for about 2 days. And then she told me Jonghyun of SHINee has left this world. I was in shock, not sure what to believe. Until I saw the official statement by SM ent. He really left this world by his own choise. He suffered from a depression and had lost the fight. Now you think why would this be a reason to update late. Well as a Kpop fan myself, and one of the first groups I loved when joining the kpop world. I couldn’t imagine that such a bright person, who was always there for others, would have suffered so much himself. As I suffered from depression myself, years ago, I know how it feels. I can’t know how he felt but I hope he found what he was looking for now, peace. It still feels so surreal that he’s not among us anymore, and it’s affecting me more as I ever thought. Let’s just mourn and remember him as the person he was. You did well, Kim JongHyun! You did, Rest in Peace. Pictures for this blog will be updated tomorrow. Most of the day I wasn’t able to do stuff. I hope you understand. ♥ Yarn: in the colors Light Yellow, Light Brown, White, Green, Red, Pink and Black. ♥ Embroidery needle with black and red thread or black and red felt. At row 16 you worked in Back Loops, now join with Green in the front loops and make 42SC, Fasten off and weave in tail. 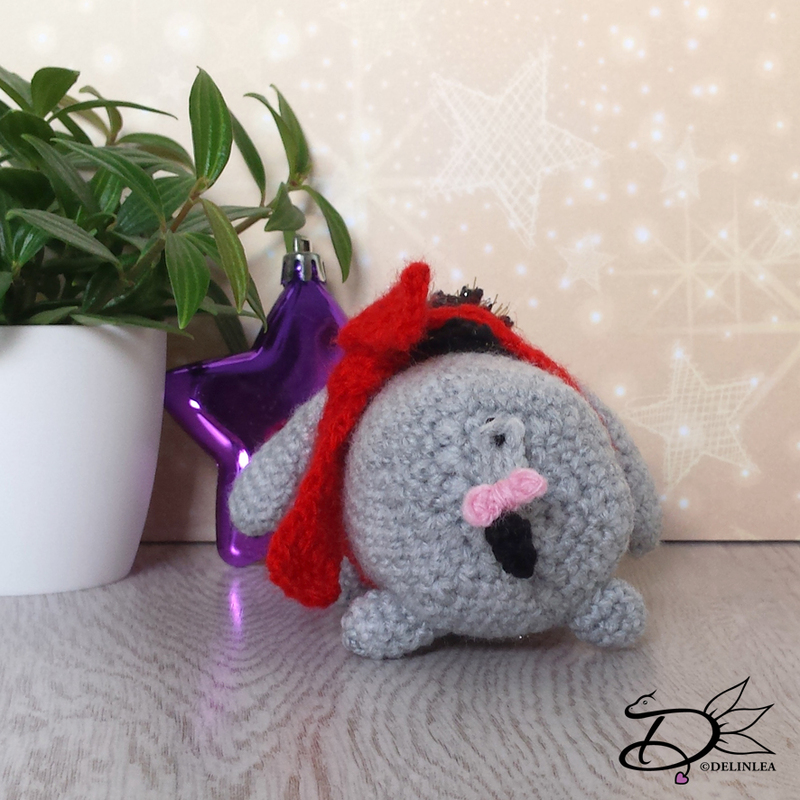 For the eyes and nose you can either choose to use felt or you can embroider them on. I chose to embroider them on, cause yeah why choose the easy way haha. But which way you choose, Dale will look cute. I’m sorry that the pattern is late today. I hope you liked this pattern anyway and don’t forget to show yours with the #DelinleaDIY! 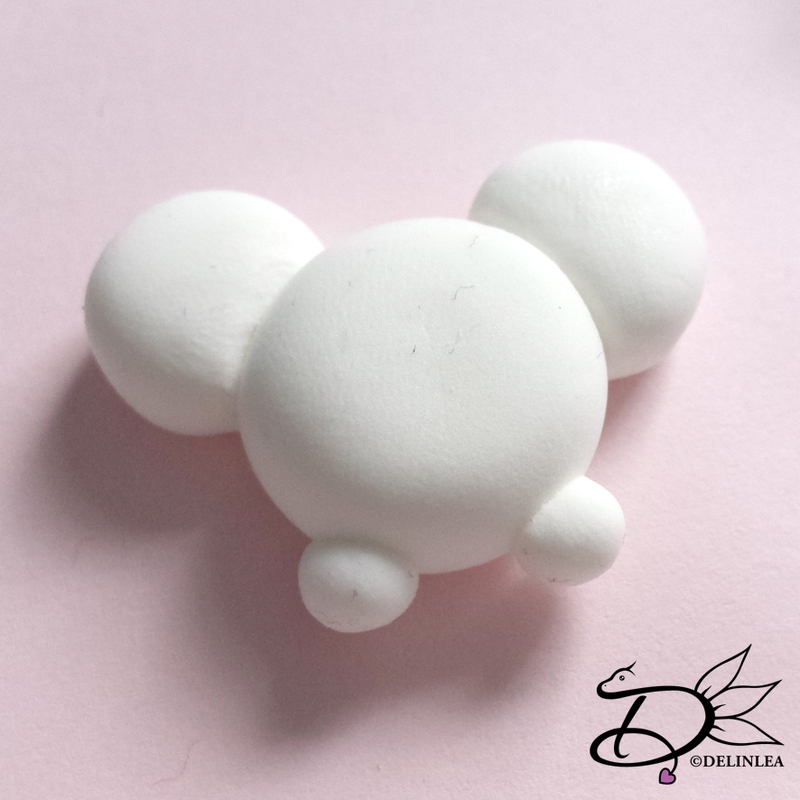 It’s time for a new DIY, let’s make some clay snowflakes with a little Tsum Tsum in the middle. I originally planned to make those with a dragon, but there’s no way I have time for that right now! haha But I will make them after Christmas. I just can’t abandon my dragons. Start with 5 even balls of clay and roll those out into a long, tear drop shape. Flatten widest part a bit and make 2 notches, I used a silicone brush for it. This way you make you snowflake a little bit more interesting! Ofcourse you can make your snowflake however you want. 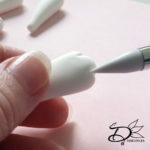 Now attach the small ends of the tear drop shapes together, evenly spread. Then make the Tsum Tsum out of clay. I’m not gonna explane how to do that exactly. Tho you make a round shape and add legs. You can add other features too. depends on what Tsum Tsum you wanna make, that’s totally up to you. I chose to make Mickey so I added ears as well. I made it in white clay, so I will paint it with Acrylics. So I let the clay dry first, painted it and glued it to the middle of the snowflake. 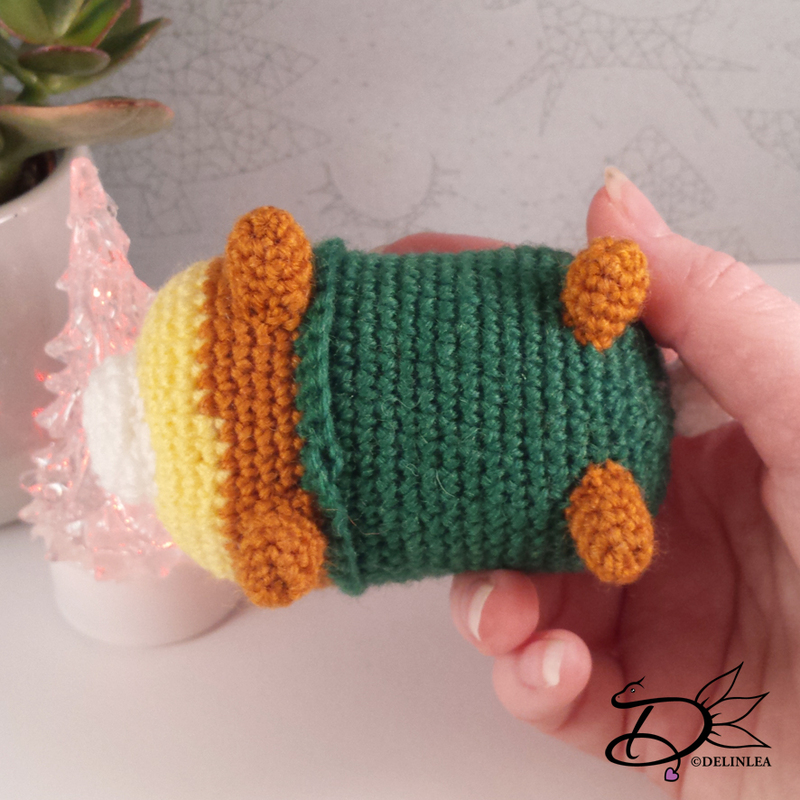 But if you don’t have to paint anything or just the eyes, you can stick your Tsum straight to the middle and let it dry that way. Now it’s time for a bit of decorating. This is totally optional, but fun to do. I added some glitter to the ends of the Snowflake. And added some angel hair behind my Tsum Tsum. it’s give just that little extra sparkle that makes it look finished! The days are flying! I can’t believe it is already day 17! I have barely time to breath haha. But I enjoy making all these DIYs for you! 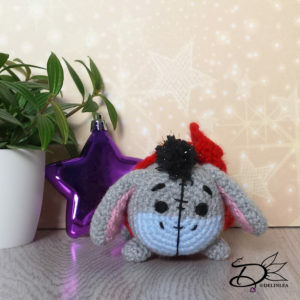 Anyway today we are gonna make a Eeyore Tsum Tsum. I always loved him. ♥ Yarn: in the colors Grey, Light Blue, Red, Black and Pink. ♥ Cloud Yarn in Black. Chain 9, insert in 2nd chain from hook, 8SC. Chain 6, insert in 2nd chain from hook, 5slst. Fasten off and sew to the end of the base of the tail. Chain 4, insert in 2nd chain from hook, 3SC. Fasten off and wrap the end of the yarn in the middle, so you get the idea of a bow. And sew this tiny bow to his tail, just above the fur. 1: Chain 6, insert in the 3rd CH from hook, 4DC, turn. Sew his hair on top of the body and on the sides of the head you sew the ears. Sew his tail to his but. Wrap his shawl around his body. 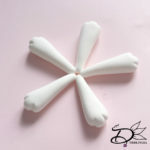 For the eyes and other features you can either choose to use felt or you can embroider them on. I chose to embroider them on, cause yeah why choose the easy way haha. 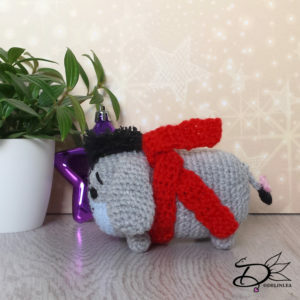 But which way you choose, Eeyore will look cute. I hope you enjoyed this pattern, I know I love Eeyore ^^ Wanna make more of him haha. Ah! And don’t forget to show yours with the #DelinleaDIY. Another day of the Christmas Countdown! Let’s make a Tigger Tsum Tsum. I decided he’s gonna be an elf, I bet he would make a mess tho if he was one for real xD. 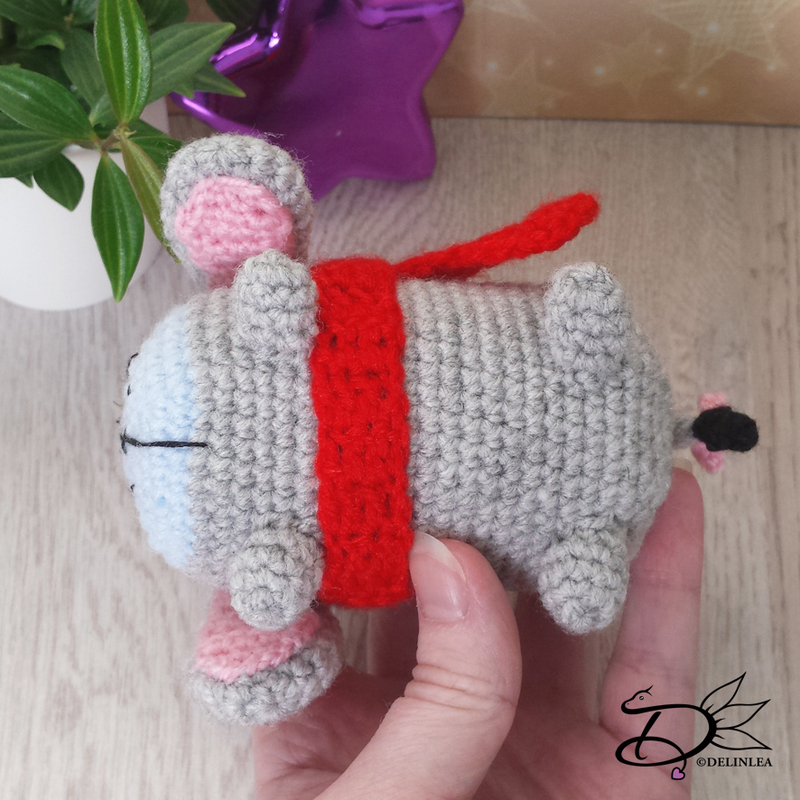 Can you imagine him bouncing around while others try to get the presents for Christmas done?! let’s go on to the pattern, before tigger starts to bounce on my key board. 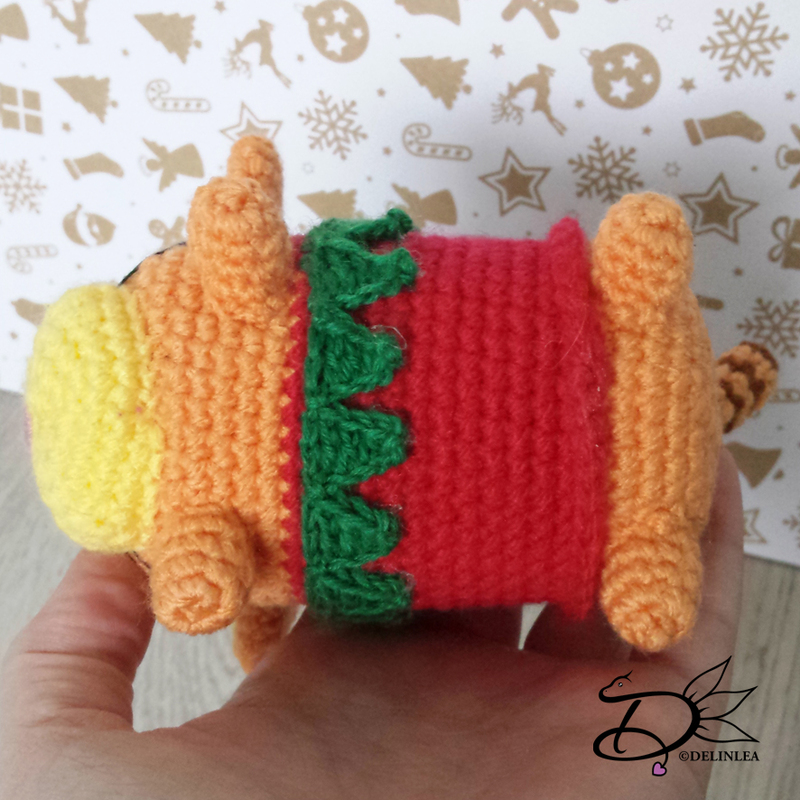 ♥ Yarn: in the colors Orange, Light Yellow, Red, Green and Brown. ♥ Embroidery needle with black, brown and pink thread or black, brown and pink felt. At row 16 you worked in Back loops only, now join in the front loops. 2: Chain 5, insert in 2nd chain from hook, SC, HDC, DC, TR, skip 2 st, slst. Repeat 14 times. At row 27 you worked in back loops only, now join in the front loops and make 42SC and fasten off. Fasten off and leave a long tail for sewing. Stuff the snout lightly. 11: Chain 4, insert in 2nd chain from hook, SC, HDC, DC, skip 1 st, slst. Repeat 11 times and fasten off. Attach the Snout just under the middle of the face. Sew the ears on both sides of the face, and in the middle you sew on his little Elf Hat. 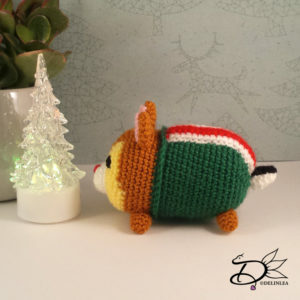 Dew his tail to his but. For the eyes and other features you can either choose to use felt or you can embroider them on. I chose to embroider them on, cause yeah why choose the easy way haha. But which way you choose, Tigger will look cute. 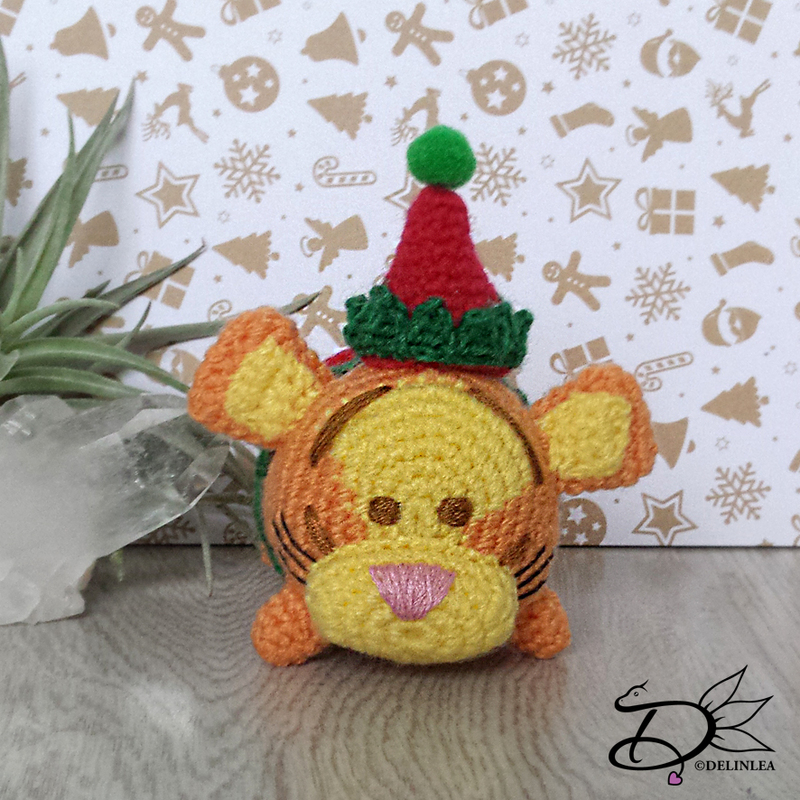 Tigger is totally ready for Christmas, are you as well?! I’m not really ready yet, so much stuff to do. But I’m sure I will survive! Have a lovely day ya’ll! And don’t forget to show your Tigger with the #DelinleaDIY.